Get ready to race on the virtual streets in Pokies.com’s latest hit game Drive: Multiplier Mayhem. Drive: Multiplier Mayhem is an online slot game unlike any other. 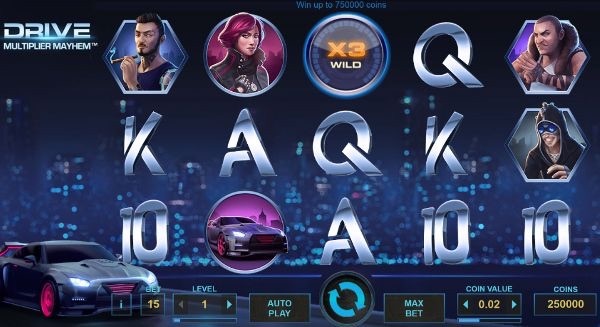 This latest offering from NetEnt, Pokies.com’s players’ favorite game designers, is an action-packed game that catches the thrill of illegal street racing in a slot game form. What sets Drive: Multiplier Mayhem apart from the rest are multipliers. With a healthy doze of luck you may find yourself in a situation where you are playing free spins with 120 times your bet size. This is for sure a record-breaking bet for free spins, at least none of us here at Pokies.com’s office can remember any game coming even close. Thanks to the multipliers Drive: Multiplier Mayhem has a huge maximum win: you can win up to 750,000 coins with one spin! Even playing with the minimum coin size of $0.02 this would be a win of $15,000 with one lucky spin. Besides boasting crazy multiplier wilds and impressive graphics (NetEnt games always look better than the rest) this 5-reel, 3 bet line video slot plays perfectly on PC, Mac and mobile devices including iPhone, iPad, Android phones and tablets.